The VDIV10:1 uses precision resistor networks to bring sensors with high output voltages into the datalogger’s common mode range, allowing the datalogger to measure the sensor. The VDIV10:1 divides the sensor’s signal voltage by a factor of ten. The VDIV10:1 contains a 90 kΩ resistor and a 10 kΩ resistor. Both resistors have a ratio tolerance of ±0.02%. The maximum input voltage into the VDIV10:1 should not exceed ±50 V. Increased input settling time may be necessary to accommodate the relatively high resistance of the voltage divider. CR200X (retired) User-modifications are required to use the VDIV10:1 with the CR200X series. Contact Campbell Scientific for more information. CR216X (retired) User-modifications are required to use the VDIV10:1 with the CR200X series. Contact Campbell Scientific for more information. CR9000X Compatible CR9000X modules are the CR9050 and the CR9052; the CR9051 is partially compatible. The VDIV10:1 uses two adjacent single-ended analog inputs (one differential channel); an adjacent analog ground channel accepts the "ground prong" of the VDIV10:1. Not all data logger terminal strips have this sequence on all channels, so please check your data logger's wiring panel to confirm channel assignments, especially if you plan to use multiple terminal input modules. Please note that if a CR10X will be used to measure thermocouples in the same application, newer CR10X Wiring Panels and the CR10XTCR Reference Thermistor (with its accompanying thermocouple cover) are deep enough to cover the data logger input channels with a VDIV10:1 attached; older CR10TCRs are not deep enough. The VDIV10:1 is measured with either the VoltSE or VoltDiff Instruction in CRBasic, and with Instruction 1 (SE Volts) or 2 (DiffVolts) in Edlog. Each VDIV10:1 can be wired to make one differential measurement or two single-ended measurements. What is the maximum input voltage that a VDIV2:1 or VDIV10:1 can handle? These two voltage dividers can handle different maximum input voltages. 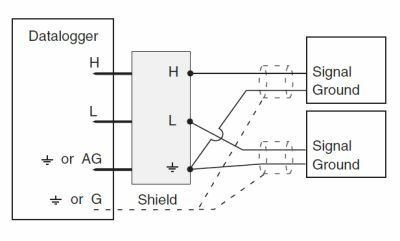 The VDIV2:1 has a maximum input voltage of 10 V.
The VDIV10:1 has a maximum input voltage of 50 V.
What is needed to write a simple program that will read two analog channels (0 to 10 Vdc)? The CR1000 can measure analog voltages in the ±5 Vdc range. 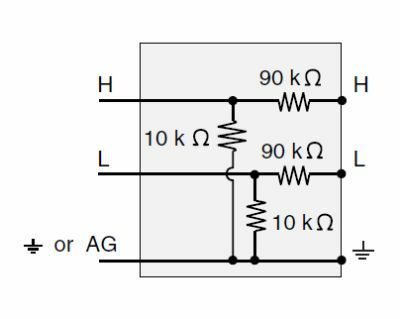 A voltage divider such as the VDIV2:1 is required to reduce 10 Vdc to an acceptable range. For examples of wiring and programs, see the VDIV10:1/VDIV2:1 manual. Is there a way for a CR1000 to measure a 12 Vdc voltage without an external circuit? 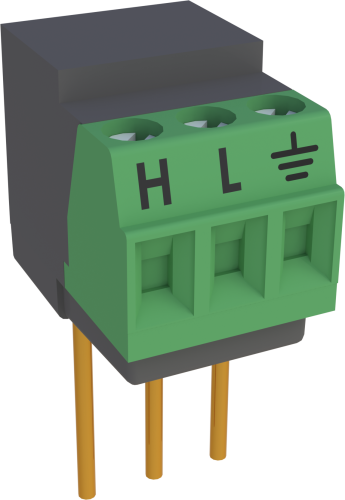 The CR1000 has analog inputs that measure voltage in a ±5 Vdc range. To measure a 12 Vdc voltage, a voltage divider is needed. In its simplest form, a voltage divider comprises two resistors. Precision differential voltage dividers, such as the VDIV10:1, are available for this purpose.